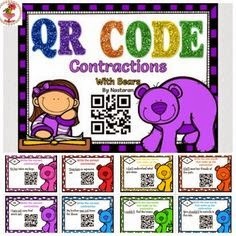 QR CODE: Contractions With Bears contains 32 task cards. On each card there is a sentence. Students are to write the correct contraction for the underlined words or the two words that make up the contraction. An answer sheet is provided for student answers and an answer key is given for the teacher.